On April 12, 2019 in Warsaw conference Friendly Courts for All. Availability of Courts for People at Risk of Exclusion took place. The conference was organized by Court Watch Poland Foundation. communication and savoir-vivre rules regarding contact with people with disabilities. The main goals of the conference were to draw attention to the problems of people at risk of exclusion, to educate court employees in the field of communication with people with disabilities, to create a platform for exchanging experiences and to present the requirements of the UN Convention on the Rights of Persons with Disabilities. Trainings and workshops were also carried out to increase awareness, broaden knowledge and acquire practical skills. Among more than 100 participants from all around Poland were directors and presidents of courts, directors of economic departments, courts’ administrative staff and customer service officers. The conference was inaugurated by professor Małgorzata Fuszara, director of the Institute of Applied Social Sciences of the University of Warsaw and government plenipotentiary for equal treatment in years 2014-2015. Prof. Fuszara in a short lecture presented the main problems that people with disabilities and at risk of social exclusion face every day and emphasized the need for education and continuous raising of awareness of public administration employees in this area. 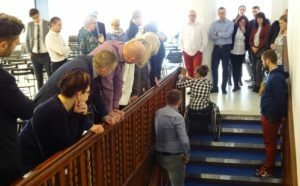 Then, the President of the Court Watch Poland Foundation Bartosz Pilitowski presented the results of research on the accessibility of court buildings for people with disabilities. Research was carried out by the Foundation as part of the Citizen Court Monitoring. Practical sessions followed the presentation and a short brake. Attorney Katarzyna Julia Kowalska, PhD from the University of Warsaw lead a session titled Service for People at Risk of Social Exclusion. My workshops were aimed at sensitizing court employees to life situations that people at risk of social exclusion or socially excluded face on a daily basis. Life struggles of these people directly translate into their specific needs in contact with the justice system. Together with the participants of the workshop, we tried to define the problems of excluded people, their specific needs and specify how the court employee can meet these needs and how to fulfil the constitutional right of access to court. Workshops had the brainstorming and active group work formula. Court employees could exchange their experiences and thus try to work out some standards of behaviour while handling specific problems of people at risk of exclusion – dr. Kowalska said. One of the participants of dr. Kowalska’s workshops said – As far as contact with excluded people is concerned, court employees notice many shortcomings in the operation of public administration. I believe that the establishment of a catalogue of good practices from the conclusions gathered during the workshops and its popularization could significantly facilitate and improve contact with such persons. 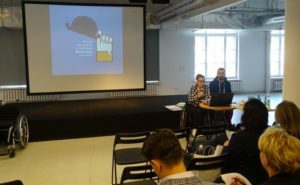 The next block of workshops, conducted jointly by attorney Katarzyna Heba and professor Marek Wysocki from the Gdańsk University of Technology, consisted of two practical sessions: Principles of universal design and Availability of justice for people with disabilities. Speakers during the workshops talked about the realization of the rights of people with disabilities and adaptation of legislation to the provisions of the UN Convention on the Rights of Persons with Disabilities in the context of universal architecture. Specificity of the work of a professional attorney with visual disabilities also has been discussed. 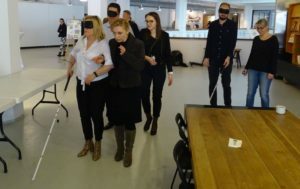 Simulations were also carried out, during which the participants of the workshops could experience visual disability on their own and take the role of a guide of a visually impaired person. The main goal of the workshop was to present the principles of universal design and procedural barriers in access to justice, which are experienced by the parties of the process, as well as by professional attorneys and employees who may be people with disabilities – att. Heba said. 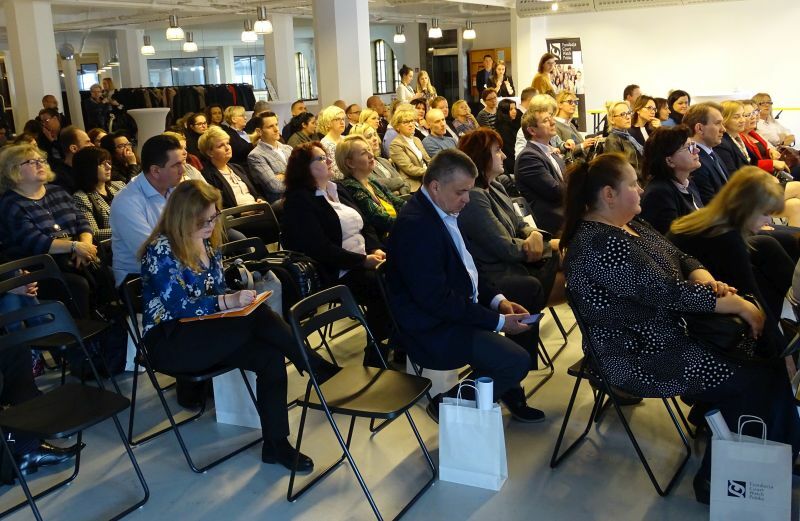 President of the District Court for Łódź-Śródmieście in Łódź, Krzysztof Kurosz, PhD has commented – The conference was very inspiring and we will try to draw practical conclusions from it, for example in the form of an internal audit in the scope of the availability of court buildings for people with various disabilities. We strive to keep up to date with reports on the subject of access to justice for people with disabilities. The value of the conference is that it gives an opportunity for direct and practical transfer of information, expanding our knowledge on this subject. Unfortunately, although we notice physical barriers that people with disabilities may encounter, often the range of adaptation of the existing infrastructure is largely limited. The information provided during the conference should be collected in a kind of catalogue of good practices, adopted then and applied at the level of relevant ministries, thus becoming a guidepost for those who will design future public-service buildings. I have attended such workshops for the first time. The lecturers presented the subject of barriers in court architecture for people with disabilities in an interesting and reliable way. With the help of a special eye band and white cane, I was able to experience how blind people function and move. Specific technical solutions that could be used in court architecture have also been presented, so that their functionality for blind people would increase significantly – said another participant of the workshops. The next workshop was conducted by Sylwia Drozdowska, an instructor of active rehabilitation, a person moving in a wheelchair. The main goal of the workshop is to present to non-disabled people the ways we can use to help people in a wheelchair. How to do it in a safe way, both for the person on the wheelchair and for themselves. The workshops were divided into two parts. 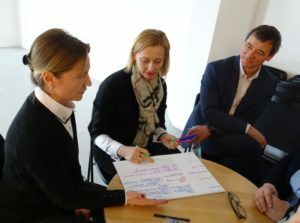 The theoretical part was designed to present good practice in communication and savoir-vivre principles in contact with people with disabilities. The second, practical part was to a large extent the presentation of the techniques of helping wheelchair users and the possibility of using a wheelchair to better empathize with the situation of persons with disabilities. 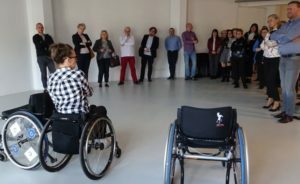 Moving on a wheelchair is not easy and it is very important that employees of public offices should be aware of this and be able to help people with disabilities – Drozdowska said. One of the participants of the workshop commented on them in this way – There were very interesting lectures and workshops conducted by extremely fascinating people. For someone who does not work with disabled people on a daily basis, direct contact with a person on a wheelchair is very inspiring. It makes us aware of everyday problems of people with disabilities and opens our eyes to the problems of access to our institutions, which, unfortunately, we do not pay enough attention. For us things that seem obvious, such as the usual opening of doors, from the perspective of a disabled person acquire a completely new meaning. The workshops encourage reflection and we have a lot of things to rethink right now. The Court Watch Poland Foundation would like to thank to all the speakers and lecturers for very interesting and inspiring workshops and to all conference attendees for their active participation in practical sessions. We express deep hope that the conference and the research carried out by the Foundation will contribute to popularizing the topic of access to justice for people with disabilities and those at risk of exclusion.